Gujarat State Examination Board Has published Notification for The Teacher eligibility Test(TET 1), TAT(S) And TAT Higher Secondary 2017. These are the most awaited examination from last year. 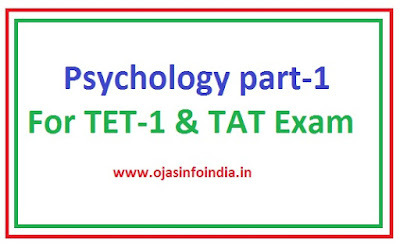 This Exam is conducts in Single Paper of 150 marks For TET-1 And 200 Marks For TAT as per syllabus. TET,TAT,HTAT exam Candidates have best option for Online preparation via our website www.shikshanjagat.in. This Site Is for Gujarati Competitive Exams Like GPSC,HTAT, Police,TET,Clerk,Bank etc...Preparation. On this site you will find lots of material for Exam Preparation in Gujarati, Hindi And also in English. Keep Visiting This Site Daily to Improve your Knowledge. Psychology is the most asking subject in TET,TAT,HTAT exams. Here we bring a Child Psychology and Educational Fundamentals Quiz series for the candidates who are preparing for Upcoming TET-1 And TAT exams 2017.